Under the budget passed by the General Assembly this week, state funding for postsecondary education will be cut over the next two years, with total biennial decreases of 2.5% for financial aid resources and for institutional funding. 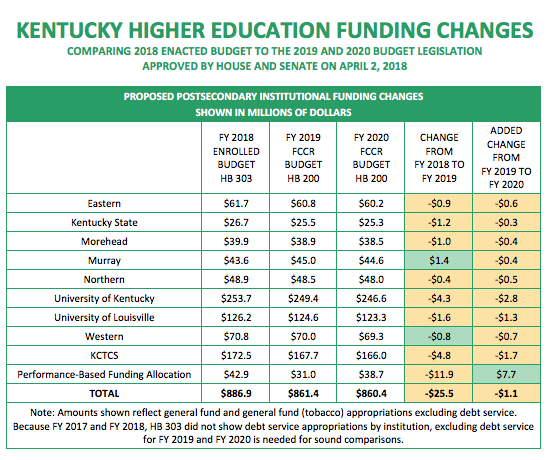 This continues the pattern of state disinvestment in Kentucky’s postsecondary institutions that has persisted since 2008. Since that time funding reductions total $222.6 million or 21%, a disinvestment whose costs are ultimately born by students and families. The enacted budget decreases state financial aid $12.6 million in FY 2019 and adds back $8.2 million in FY 2020. The majority of the decrease comes from reductions in the Work Ready and Dual Credit scholarships. Needs-based CAP and KTG would receive 45% of the net lottery proceeds, as compared to the 55% required by statute – but substantially more in dollars than the previous budget, approximately $28.5 million more over two years. Only 94.5% of net lottery revenue would go to financial aid, meaning $13.9 million would be shifted to other areas of government. The current budget, as well as the Governor and House’s proposals for the next two year had returned 100% of net lottery revenue to financial aid. The enacted budget returns to a practice of budgets in years past that uses lottery revenue to pay for other areas of government. Unchanged funding for National Guard Tuition Assistance, remaining at $7.4 million annually. The enacted budget decreases state funding to public postsecondary institutions by $25.5 million in FY 2019 and another $1 million in FY 2020. While campuses are directly reduced approximately 6%, some of this cut may be earned back through performance-based funding. In FY 2019 $31 million and in FY 2020 $38.6 million is allocated through the performance-based funding model based on institutional success at meeting goals. Both years would be less than the $42.9 million allocated to performance-based funding in FY 2018. Kentucky cannot expect to meet its needs for economic growth and quality of life through continued disinvestment in education. Our human capital is the primary economic engine and it is imperative to support the educational opportunities necessary for success in school, career and life. 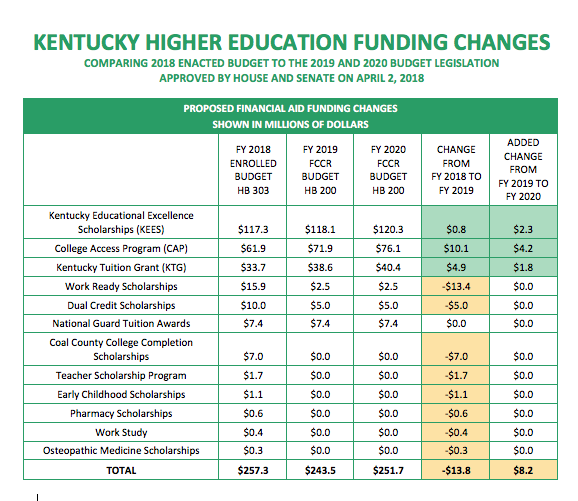 Despite increases in some state financial aid programs, issues of affordability and access to postsecondary opportunities for all Kentuckians’ make further reductions to institutional funding difficult to stomach. 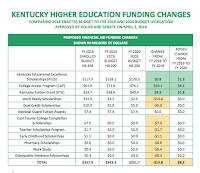 In the future, Kentucky needs to more effectively link decisions and policies on state appropriations, student aid and tuition to better define the expectations of institutions and students. 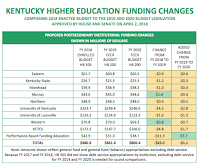 Lack of transparency in how postsecondary education is financed, and how the varying financial components interact, ultimately leads to less effective and efficient use of public resources and makes it more challenging for Kentuckians to reach their educational, economic, workforce, and civic potential. We’ve created a PrichBlog summary with one page to show financial aid changes and a second to show the institutional budgets. You can download that here, or view the complete budget bill as approved by the General Assembly here.